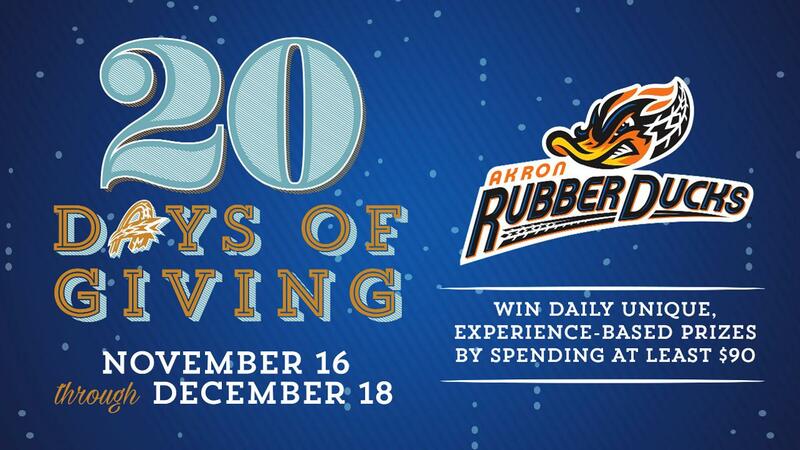 AKRON, OHIO) Nov. 13, 2018 - The Akron RubberDucks announced today the return of the annual "20 Days of Giving" starting Friday, Nov. 16. The "20 Days of Giving" is packed with unique, experience-based prizes only available during this once-a-year promotion. In addition to several autographed items and unique fan experiences, some of this year's prizes include an authentic retired #23 electric blue jersey, which was retired in 2018 by the team in honor of LeBron James, a cooking lesson with executive chef James Phillips, a promotional night devoted solely to the winner, a guarantee of all 2019 bobblehead giveaways, a card in the official team set, and a chance to be the to win the grand prize of a free airline ticket (up to $500). A complete listing of all 20 prizes is below. "The 20 Days of Giving is one of our most popular annual promotions," said Dave Burke, RubberDucks Vice President, Sales. "Several of our fans' favorite prizes are returning such as the giveaway guarantees, a chance to suit up a kid for batting practice, and to watch post-game fireworks from the dugout. We are excited about some of the new prizes for 2018, including an authentic cream-colored jersey, a suite for the Fourth on the Field Extravaganza, and a unique cooking lesson with The Game Grill + Bar's amazing chef, James Phillips. There's a prize to excite every RubberDucks fan for this holiday season!" The promotion will run on 20 weekdays through Tuesday, Dec. 18, excluding Nov. 21-23 for the Thanksgiving holiday. Fans who have already committed for the 2019 season are eligible to win. Deadline to enter is Tuesday, Dec. 18, at noon. A random winner will be selected daily and announced on the RubberDucks' website, www.akronrubberducks.com, Facebook page www.facebook.com/AkronRubberDucks, Twitter feed @AkronRubberDuck, and on Instagram at @akronrubberducks. Fans can secure season tickets, flex plans, or arrange a group outing by contacting the Akron RubberDucks ticketing department at 330-253-5151, online at www.akronrubberducks.com or by email at ticketservice@akronrubberducks.com. The Akron RubberDucks are the Double-A affiliate of the Cleveland Indians and defending Eastern League champions. The 2019 season will be the franchise's 23rd since moving to Akron and its sixth since becoming the RubberDucks. The Home Opener is on Thursday, April 4, at 6:35 p.m. vs. Altoona Curve.